It’s Gratituesday! Today I am grateful for the bicycle I have. It was a gift a year or two ago from a friend who was clearing out her possessions for an anticipated move overseas. I’m sure she had no idea how much her gift would bless my life. That bicycle has been one of my essential forms of transportation. Four drivers and sometimes only two cars has necessitated some juggling. Having the freedom to hop on my bike for a run to the library or the post office or to visit a friend has freed up my schedule and saved me hours and gas money and frustration. The build of this particular bike lets me sit in such a way that my back doesn’t tire out and get sore, which I thought was simply one of the sacrifices bike riding required until I met this bike. Now I can ride for miles and still feel relatively young and agile in spite of the often harsh realities of my aging body. 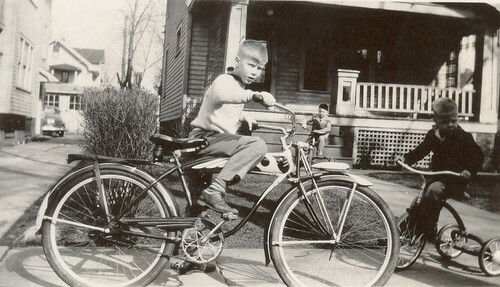 There’s nothing else I know of that brings back the joys of childhood as readily as a bike ride. Such a sense of independence grabs hold of you when you throw your leg over the seat and set the wheels of a bike in motion. Feeling the wind blowing past peels off layers of years mentally and emotionally. There’s the added bonus of being able to take off in the early light, helmet on, breezing through an exhilarating morning past some of my favorite sights and sounds. Getting my heart pumping and my lungs filled with fresh oxygen by pushing those pedals starts the day off with a burst of energy and joy. What a wonderful way for a day to begin. I celebrate the bicycle every time I ride. In fact, I’m celebrating life as I ride, feeling youthful, free, energized, grateful. What joy! Surely someone has created a worldwide holiday in honor of the humble, practical, fun-loving bicycle.